Hazel and Richard welcome you to their quiet and relaxed Bed & Breakfast in the elevated part of Godalming close to CharterHouse School. 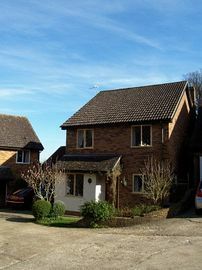 Situated coviently close to mainline station and access to A3 ( M25 ). We are pleased to see you whether on business or pleasure and our prices include breakfast. We are close and within easy reach of all the business facilties in either Godalming, Guildford or Farnham. The surrounding country side also has many treasures such as the Devils Punchbowl, Witley Common, Juniper Valley, Winkworth Aboretuem to name a few. Outdoor Sports activities from fishing, river boating, walking, riding, golf, bike trails, tennis to name a few are all around us. Call or e-mail to make your reservation. Prices are per person per night £30.00. Special Diets Provision: Special diets are catered for. Special Diets Catered for on prior request. From Godalming town centre head torwards Charterhouse, at top of hill turn into Twycross Road. Follow till you start descending. No. 52 is 50m on your right. Leave Farncombe station and head torwards Binscombe. Twycross Road is approx 1000m on the left. No. 52 is halfway up the hill on the left.